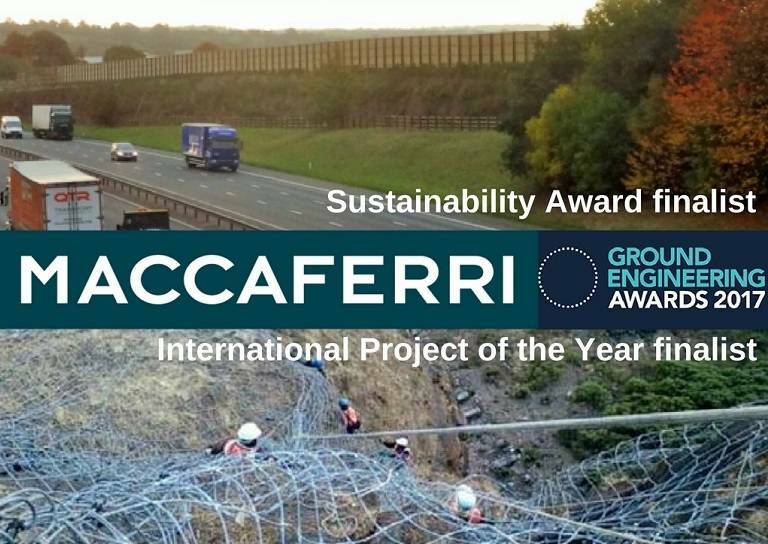 We are delighted to announce that Maccaferri has been shortlisted as a finalist for the 2017 Ground Engineering Awards; the flagship event for the geotechnical profession that celebrates the very best in the industry. Our challenging rockfall mitigation project at Saptshrungi Gad Temple, India, has been shortlisted for International Project of the Year. To protect the funicular station taking pilgrims to the temple on the top of the mountain, a 200m high rocky slope was protected with HEA Panels (High Energy Absorption) ‒ with the patented HEA ‘double knot’ connection at each crossing point of the steel wire rope ‒ and reinforced with rock bolts. Our environmentally friendly acoustic barrier shielding a residential area from the noise of the M40 Motorway in Banbury, UK, has also been shortlisted for the Sustainability Award. Made with Green Terramesh and ParaDrain systems, the structure is the result of an innovative design methodology and approach for reinforced slopes which re-uses the poor and marginal site won fill material as structural backfill within the acoustic bund. The bund utilized reinforced soil to reduce the dimensions of the bund footprint, thereby maximizing the space available for development on the site. On May 31st and June 1st, our senior management team will attend face-to-face presentations in London in front of the GE Awards judging panel, which comprises industry-leading clients, contractors, consultants and academics. The awards ceremony will be held on July 5th at the London Hilton on Park Lane, bringing together industry professionals to celebrate engineering excellence.